Downloading and installing WPMU DEV plugins couldn’t be simpler. Using our Dashboard plugin is the easiest way to add our products to your site, but we also give you the opportunity to download plugin and theme files (even older versions!) from our site directly, so you can install via the Upload New Plugin option in WordPress, or by FTP. To browse all of our plugins and themes, simply click the “Plugins” or “Themes” link at the top-left of your screen. Once you’ve found a plugin or theme that interests you, click the screenshot to go straight to its dedicated page. Each plugin or Upfront starter theme has its own project page. 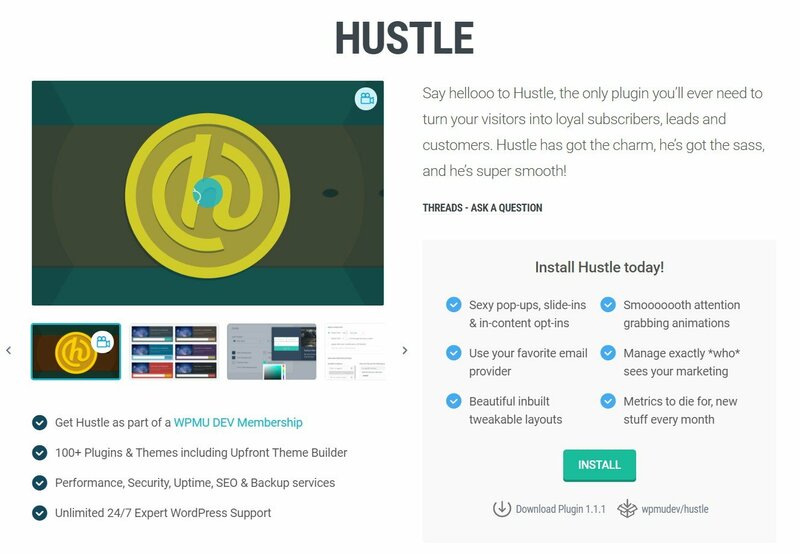 Click the link to see the project page for Hustle, our newest plugin. On the project page, you’ll see the “Install” button on the right side, and the download link beneath it (should you wish to download the product manually). Installing the WPMU DEV Dashboard before continuing with your selected plugin or theme. Simply click the “Download Now” option to be redirected to the Dashboard plugin page to get that done first. Or, If you do not wish to download and install the Dashboard at this time, click the “No thanks, just download directly” option, and the download will start right away. If you are a trial member, and try to download a plugin or theme from the project page, you’ll be prompted to download the dashboard plugin. At this time, we don’t allow direct downloads until you are a full (non-trial) member. You can bypass this by skipping the free trial, from your hub account tab, which charges your payment method and unlocks the full, magical WPMU DEV experience. Clicking that button when the Dashboard is installed on a site will pop open a modal where you can select the site where you want to install the product. Click the link to “Install” or “Update” the plugin or theme you have selected and a new window will open in your browser to reveal the WPMU DEV Dashboard install page on your selected site, with your selected product already highlighted and ready for you to install. How cool is that?! Please visit our Upfront documentation, specifically Upfront Installation and Overview, for detailed instructions about installing Upfront core and Upfront starter themes. Although we highly recommend always using the most current version of our plugins and themes, there might be times you want to download an old version. Simply navigate to the plugin or theme project page. Below the project page description and features, click the Changelog link. In the popup that appears, you can then see all of the previous versions we’ve released, just click on the “Download” button for the relevant version number and the download will start. Please note: You do need to hold an active membership to download current and past versions. From time to time we may retire a product which has become outdated or unfeasible to continue supporting. To see an updated list of which of our products have been retired, please read Retiring our Legacy Plugins.